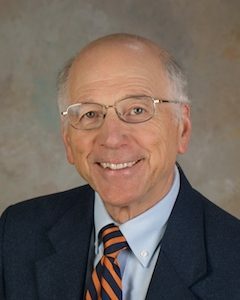 Stewart Schneller, professor in the Department of Chemistry and Biochemistry and former dean of the College of Sciences and Mathematics, was selected as a 2017 Fellow of the American Chemical Society. The prestigious honor recognizes outstanding achievements in and contributions to science, the profession, and the American Chemical Society. “Needless to say, I am honored by this recognition that also acknowledges those who have been part of my career: undergraduate and graduate students, postdoctoral research associates, my professional, faculty and administrative colleagues, and my family,” said Schneller. Schneller was recognized by the Charlotte, North Carolina, American Chemical Society section in 2002 with the Stone Award, given annually to a chemist in the Southeast who has “excelled in research, development of the next generation of scientists, public outreach, mentoring, innovative educational efforts, and public outreach. He has also held numerous positions in the Division of Medicinal of Chemistry of the American Chemical Society. Schneller began his academic career in 1971 as an assistant professor of chemistry at the University of South Florida. He rose through the ranks becoming full professor seven years later in 1978, and chair of the 32-faculty-member department in 1986. While at the University of South Florida, Schneller taught sophomore organic chemistry and graduate courses in heterocyclic chemistry, medicinal chemistry, and natural products, and was named Outstanding Professor by the graduating senior class. He also began his research career with a focus on nucleosides and developing novel synthetic methods, as well as researching their application as biological mechanistic probes and as anticancer, antiviral and antiparasitic agents. The research was funded by $2.6 million in external grant support. In addition to leadership in the Division of Medicinal Chemistry of the American chemical Society, he hosted the 7th International Congress of Heterocyclic Chemistry and served as president of the International Society of Heterocyclic Chemistry. Schneller chaired the Institute of Environmental Studies at the University of South Florida, and served as the university’s Faculty Athletic Representative to the NCAA for 13 years and as president of the Metro Conference and the Sun Belt Conference. He was a consultant for Burroughs Wellcome (now Glaxo Smith Kline) pharmaceutical company. In 1994, Schneller came to Auburn as dean of the College of Sciences and Mathematics, professor of chemistry and biochemistry, and associate director of the Alabama Agricultural Experiment Station. He continued his research in nucleoside antiviral drug discovery that has been funded with greater than $8 million from the National Institutes of Heath (NIH). His focus has been on those viral pathogens that block host immune response to their presence, including the flavi- and filo viruses. While dean, he served four years on the Med Chem A study section of the NIH and continues to serve in an ad hoc capacity. His research has appeared in more than 150 peer-reviewed publications, and he is credited with a number of provisional patents. He is on the editorial boards of the Journal of Heterocyclic Chemistry, Heterocyclic Communications, Current Medicinal Chemistry, Medicinal Chemistry, and Antiviral Chemistry and Chemotherapy. From 2010 to 2012, he served as a regional editor for the International Journal of Medicinal Chemistry. Twenty-nine doctoral students, nine master’s students, and 29 postdoctoral associates who have been in Schneller’s research laboratory have gone on to academic institutions such as Cal-Berkeley, Georgia Tech, Carnegie-Mellon, Kansas State University, the College of William and Mary, and Slippery Rock University. One doctoral student became Senior Director of Chemistry at Exelisis Pharmaceuticals (having 44 patents and one clinically active drug), another a CEO of Pharmablock (a 21st century biotech drug discovery pharmaceutical company), and a third a National Academy of Sciences, Jefferson Science Fellow, U.S. Department of State. More than 50 undergraduate students have performed research in Schneller’s lab, and many have written honors theses as an outcome of the experience. After stepping down as dean in 2010, Schneller has continued vigorous research and innovative teaching activities including iBook/ePub development, internet accessible videos for course enhancement, and, recently, creating VR course material.